A scene from "Broken Blossoms"
I’m so exhausted today. With no time to recover from Nisei Week’s opening festivites, I ground thru a nine-hour work day and then had to sit thru the true epitome of silent movies; D.W. Griffith’s Broken Blossoms. There is no music, minimal dialouge or exposition. It’s literally sitting and watching an hour and a half of people pantomining. I would not wish this punishment on my worst enemies. Right now, I just want to take a long nap. The movie has put me in a stupor. The story follows an Asian guy as he attempts to spread the wisdom of Buddha in England. Everyone there ignores him, so he opens up a store. One day, he sees a girl thru he window. She’s beaten, underfed and dressed in rags. I think you can pretty much figure out the rest of the story from there. There isn’t much more to say than, I hope tomorrow’s Zorro movie makes up for today’s torture! 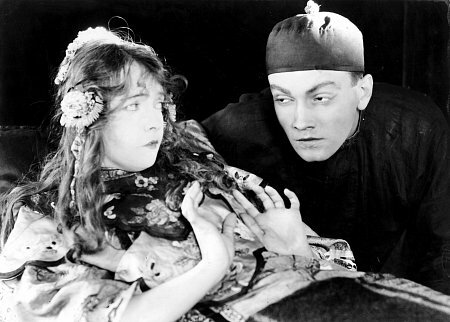 Tags: 100 Years in 100 Days, D.W. Griffith, Derrick Deane. Bookmark the permalink.